If you follow my Instagram, you saw that yesterday I ate a sausage and apple pie. I suppose you'd call it a "hand pie," but it was delicious. I know the combination of pork and apples is nothing new, but somehow this particular rendition caught me by surprise. 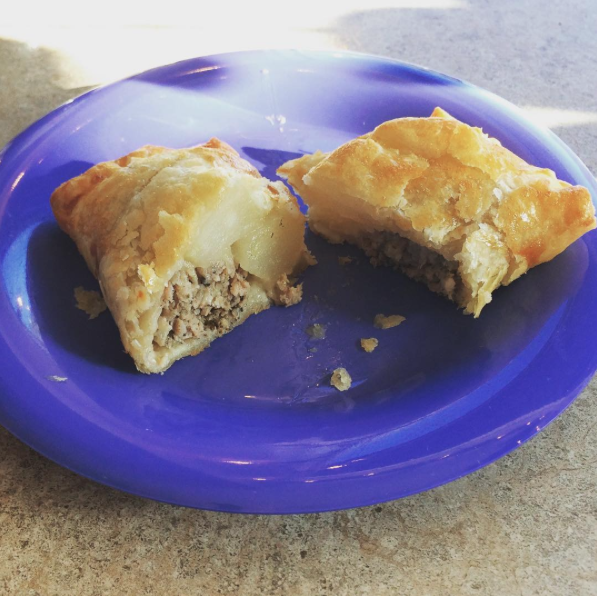 So, today I did a little Pinterest search, and I thought I'd share some pins of sausage-and-apple pies for your own tasting. Here we go! 1. Easy Pork Pies with Sage and Apple from Drizzle and Dip. I like the look of these. they look like something you'd find in a glass dome at any of my favorite bakeries in New York. I wonder, though, if my execution would be anything near as nice as these. The pie I had didn't have any cheese, but I imagine that - like most things - cheese will only make this better. This isn't really a pie, but it does include some different ingredients like cheese, orange, apple, onion, and even fennel. I wonder how this one tastes, but I think it'd probably be better for larger groups. This isn't a small pie...it's a whole big one. But, if you look at the lady's face who posted the recipe, she seems like she'd be a good cook, so I'm inclined to take her word for it. Also, this one seems pretty easy to make. Ok, now I hope you can stop salivating. Happy Wednesday!